Before you write an application, you first need to have an idea. This step consists of collecting ideas and translating those ideas into a project or program, which will form the foundation of a winning proposal application. Multiple sources of inspiration are often necessary in order to create a viable research topic. A well-written project should highlight your strengths and interests. It may be helpful at this stage to reach out to colleagues (internally and externally) in a similar or the same field. It's possible your potential project will transform and enhance an existing piece of research. 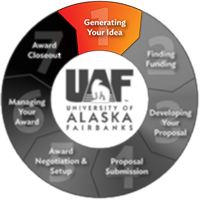 Consider talking to a potential Program Director prior to writing your proposal. This can often be the most valuable investment when seeking funding. They can give you ideas about the sponsor's funding priorities, whether your project is viable for funding, and a lot of other helpful advice. A related article on this topic is Can We Talk? Contacting Grant Program Officers by Robert Porter. Grant Space (The Foundation Center) is a great resource with information on proposal development and writing. The page includes online tutorials, webinars, info on in-person sessions, sample documents, frequently asked questions and much more.